Interns in the Norman Miller Center contribute heavily to the programming and other outreach of the center. The Norman Miller Center for Peace, Justice & Public Understanding at St. Norbert College is pleased to host the 2019 Faculty-Student Conference of the Wisconsin Institute for Peace and Conflict Studies. This year's conference theme is forced migration and human flourishing. 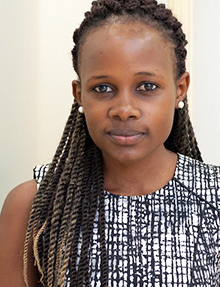 Our keynote speaker will be Dr. Mireille Twayigira, Refugee Education Advocate for Jesuit Refugee Services. A second plenary panel will be led by a delegation of educators from Åmål, Sweden, where we will also feature the American premiere of the award-winning short documentary film,“Där finns inte jag (I am not there).” Winner of the Gothenburg Film Festival Prize in November 2018 (the largest film festival in the Nordic countries), this film tells filmmaker Lama Alshehaby’s own story of forced migration. In addition to these two plenary presentations, the conference will feature 31 paper presentations, 2 roundtable conversations, 6 student posters, an interactive simulation, and lots of opportunity for conversation. The conference will include coffee breaks and lunch at no additional cost. Participation is free for faculty and students of WIPCS member schools. Cost for non-members is $15 for students and $40 for faculty. Conference rate available at the Kress Inn for April 4 and 5. Call 920-403-5100 and mention WIPCS when booking. This event is sponsored by the Wisconsin Institute for Peace and Conflict Studies and the Norman Miller Center for Peace, Justice & Public Understanding at St. Norbert College. Additional funding has been provided by the Center for the Study of Institutions and Innovation at UW Stout. For more information, reference the conference schedule or call Jill Olson at 920-403-3037. The keynote speaker for our conference will be a former refugee and medical doctor, Dr. Mireille Twayigira. Dr. Mireille became a refugee at age two. For six years, she traveled barefooted across Africa, in search of safety. Orphaned during her flight, she finally arrived to Dzaleka refugee camp in Malawi (where she attended primary school). She is now a licensed medical doctor in Malawi and lectures internationally as the Refugee Education Advocate for Jesuit Refugee Service (JRS). Her story represents well our conference theme, exemplifying both forced migration and, with opportunity, human flourishing.